Tomato vines are hardy, aggressive plants, and with the right care, produce large, sweet and juicy tomatoes. To produce the best possible tomatoes, though, tomato vines must be allowed to bear their fruit in the most natural way. The Amish are famous for their natural care of growing things, and have developed some very effective natural growing techniques for killer tomatoes. One of the first things the Amish think about when planting tomatoes is the foundation. Tomatoes require good drainage and plenty of nutrition, so plant them in a mixture of half quick-draining potting soil and half rich organic compost. Tomatoes require the very natural ingredients of water and sunshine in abundance. Plant tomatoes where they will receive full sunshine and plenty of air circulation. These are warm-weather plants that need sun to thrive and grow, particularly during their blooming and growing season. Water tomatoes twice a week to keep the soil moist. 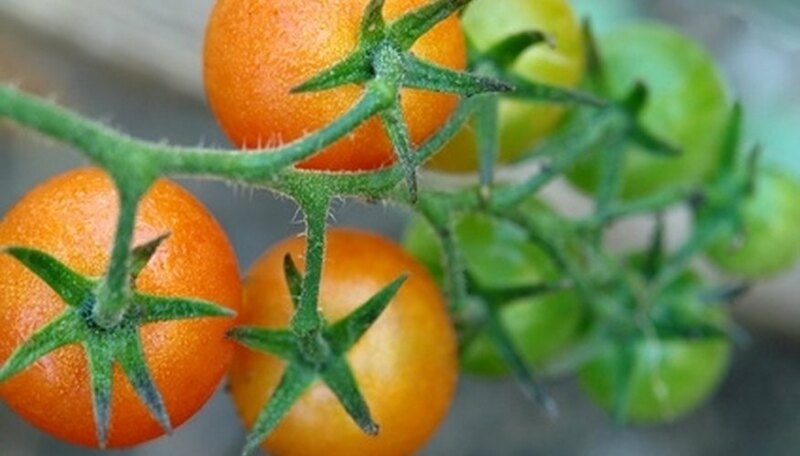 Increase waterings when the tomatoes are blooming and growing fruit. Fruit is made up of mostly water, so increasing the water during fruiting results in larger, juicier tomatoes. Stake up tomato vines when they get tall enough, using tomato cages or stakes. Tie the stems to the wires of the cage or trellis system. This gives tomato vines additional access to air, and protects both fruit and vines from crawling pests and soil-borne problems like fungus, viruses and bacteria. Mulch tomatoes using several inches of organic mulch to maintain soil moisture and keep the plants warm. When the plants are warm and healthy, they are able to put more energy into blooming and fruiting. Mulch also protects tomatoes from weeds and pests to some degree. Tomatoes are hungry plants. Fertilize them once a month with organic or 5-3-4 fertilizer. Switch to fertilizer with a higher phosphorous content during blooming to help the vines develop bigger, sweeter fruit. The Amish know to allow tomatoes to fully ripen on the vine instead of picking them early. Fruit continues to grow and sweeten as long as it is on the vine, so vine-ripened tomatoes are naturally larger, juicier and sweeter than those that are picked when they're still green. Continue watering tomato vines generously until you harvest. Pick tomatoes once daytime temperatures drop to less than 60 degrees F.
What Are the Benefits of Planting Basil in With Tomato Plants? How Often Do You Water Tomato Plants?